Yoga. Qigong. Health. Wellness. Community. Spirituality. Growth. Connect with self and others. Throughout her life Rachel has been encouraged and supported to live from her light. Through her journey of teaching yoga, Rachel desires to inspire others to live passionately and feel their own light so that they may illuminate the world. Rachel loves connecting with others and offers a safe space of acceptance and opportunities to discover how yoga can inspire your day to day. 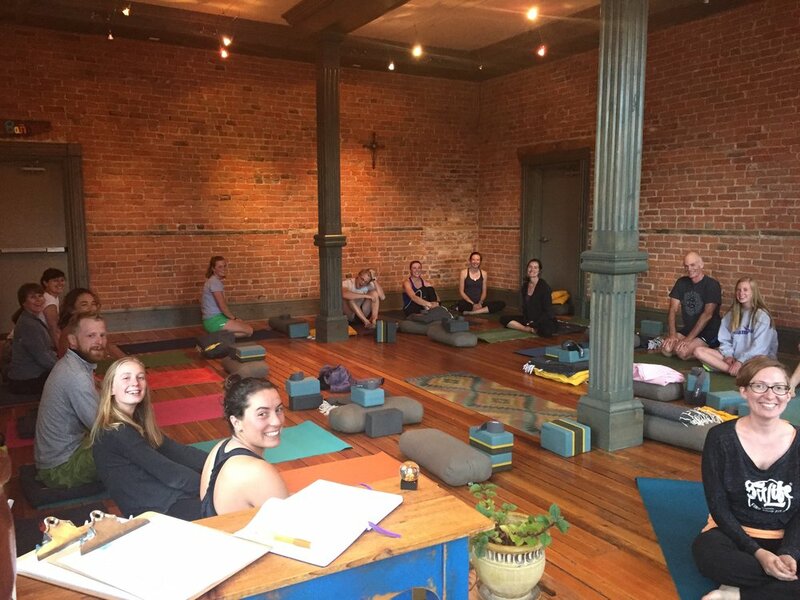 Rachel has called Leadville home for over a decade and received her Hatha inspired 200 Hour Yoga Teacher Training from the JalaBlu School of Yoga in Buena Vista, CO in 2016 and is registered with the Yoga Alliance. Leslie moved to Leadville in 1997 and fell in love with the sense of security living in the mountains brings. She has been a practicing student, teacher and friend of yoga for over a decade, and is constantly intrigued by the connection of body and mind. She is trained in Hatha yoga, but really just enjoys getting together on the mat and exploring all of the interesting things yoga adds to life. Now, after nearly 20 years of formally practicing Yoga, I am still inspired and comforted by the practice. I love to teach. Teaching deepens my own understanding and embodiment and connects me sweetly with others. It's empowering to see people light up with what's possible; whether it be a pose, philosophy, emotion....breakthroughs happen all the time on and off the mat. I love being a witness for that. Sarah Savino, Integrative Om RYT 200 and Trauma Certified Yoga Teacher has been practicing yoga for 12 years. She came to yoga at first in gyms and local community based practices searching for a balance and community. She soon found that yoga is much more than a physical practice and that is brings balance, peace, and healing to one's life. Sarah is also a trained MSW social worker and therapist and became a yoga teacher to bring more healing modalities to the lives of her clients and community. Sarah believes yoga is for everyone and the lessons we learn on our mats can be carried with us into our daily lives shaping healthier, happier, stronger communities. Inspired by her home place of Vail, Colorado, Tanya is deeply rooted in the natural rhythms of flowing rivers and expansive mountain vistas. As the former owner and guide of Trailwise Guides™ – a backcountry guide service providing experiences into the Valley’s wild places – and founder of Blue Planet Living Institute™, Tanya brings the nature/human relationship to the forefront of everyday wellness, resilient living, and planetary purpose. Her yoga practice began in 2001 at Vail’s Yoga for Athletes Studio. It expanded in 2005 to a 200 hour teacher certification in Hatha yoga from Shamabhava Yoga at the Shoshoni Ashram in Nederland, Colorado. Introduced to aerial yoga in 2015, Tanya was certified to teach this style of yoga by Carmen Curtis of AIReal Yoga™ in Ventura, CA. As an aerial yoga instructor and founder of Blue Planet Living Institute, Tanya brings her 20-year background in wilderness guiding to the hammock for meaningful practices in Earth awareness where connections to self, community, and nature are ignited. Credit Card purchases available online. Cash or check only at the studio. At Ray of Light we value your feedback. Please take a moment to help us understand what makes your experience meaningful at Ray of Light. Your feedback will help us understand what you love and what could be improved. We ask that you only give feedback on the teachers you have taken classes from and that you include at least one strength and one area in which you feel there needs attention and focussed time to develop. We desire to grow as teachers as well as develop our space to better fit your needs! We invite you to give feedback to a teacher that you have had a class with.